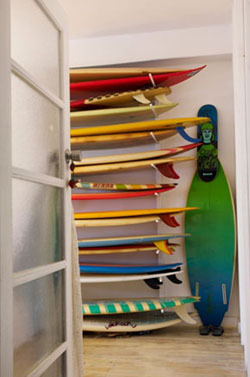 : Board Collector: I know history will look favorably on me because I will write it. I know history will look favorably on me because I will write it. 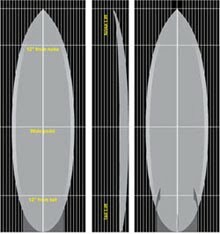 Which is interesting when you look at the written history of innovation surfboard design with a focus on twin fins, which I do, obsessively. 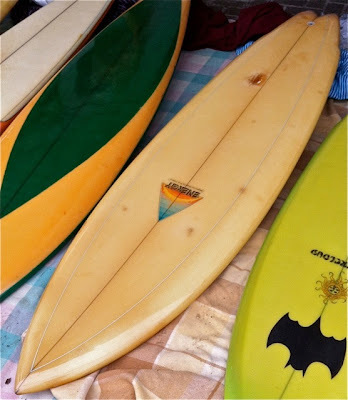 Geoff McCoy is most famous for virtually reinventing the modern short board with his no nose plan shape, and almost as famous for religiously sticking to single fins, post 1980, with his Lazor Zap designs and partnership with Cheyne Horan and Ben Lexan on the Star fin winged single fin. 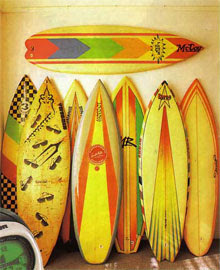 Simon Anderson is most famous for pioneering the 'Thruster' design, 3 fins of equal size, that he partly credits with coming up with due to his dislike of the twin fin, in 1980. What history fails to record is that Simon and Geoff both shaped twin fin during this period, obviously with varying degrees of success. I am fascinated with these anomalies, these freaks of the evolutionary trajectory of modern design. 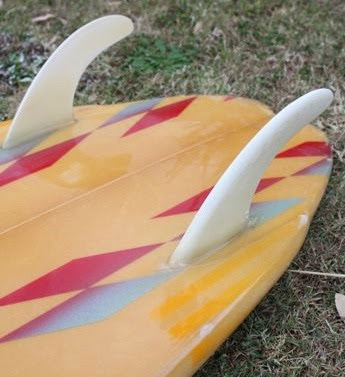 I'm not accusing anyone of lying, I'm just saying they didn't seem to hate twin fins that much at the time, as it appears they both made quite a few between 1980 and 1982. 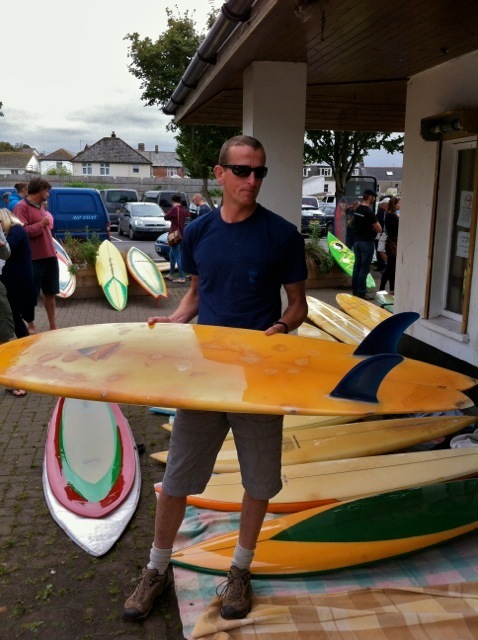 I travelled all the way to the UK to meet Pete and see his beautiful Energy twin fin. 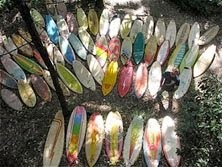 Pete moved to the UK from Sydney and took his board collection with him. Pete found this board abandoned in the back yard of his rented house. It had been wedged into a palm tree and left for so many years it took a chain saw to pry it loose. I found this Simon Anderson shaped Energy twin fin in Sydney. A nice board with a classic Energy spray whose outline and tail shape would probaly be better served with a single fin on it. 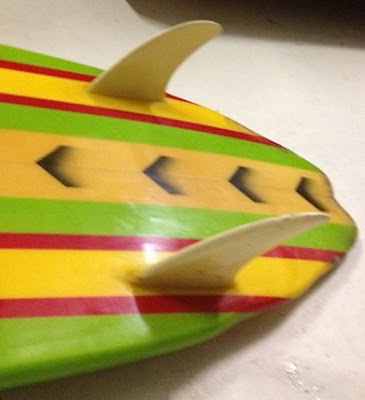 Still its interesting to note that Simon was still shaping twin fins at the time. 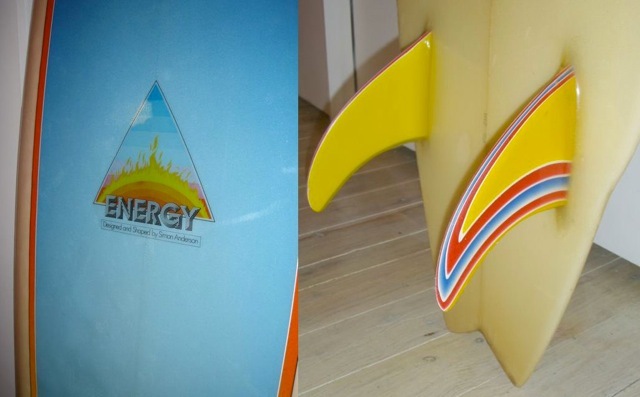 Like wise I think its facinating that Geoff McCoy made these twin fin Lazor Zap twin fins when Lazor Zaps almost by definition are seen as single fins. 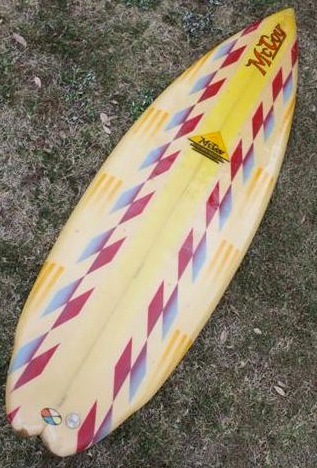 This board has the classic Lazor Zap outline and pretty standard wide base twin fins. 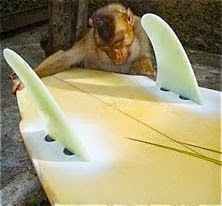 This board on the other hand is even more interesting because Geoff was experimenting with the twin fins themselves as well as the board. These thin extended fins are similar in concept to other singles he was doing at the time. 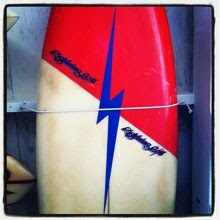 I saw this board at Mick Mock's vintage surf auction almost 10 years ago and it has facinated me ever since. 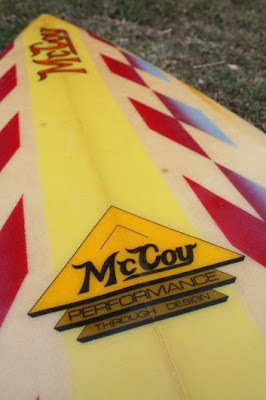 This McCoy twin dosent carry the Lazor Zap decal but it does share the same plan shape and Zap style spray. 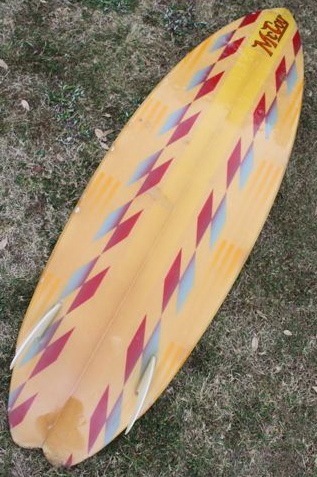 Was is interesting to me here is the the fins are half way between to two above. Thin at the base with extendend rake. I'll leave the last word to Mark Richards, who says "I never really understood why people had trouble with twin fins. 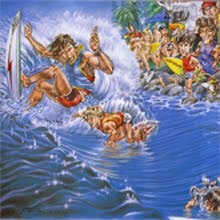 It seems they were under the misconception that you have to nurse them or they would spin out, but in fact the harder turned the better they held in, especially in hollow waves. 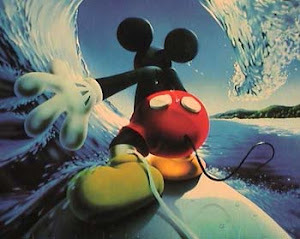 It was a bit harder on a fat wave, you had to be more careful how you set your edge. 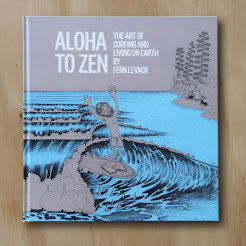 The big thing people had trouble with on the twin fin was surfing backhand, and that might have been what brought the popularity of them undone. Backhand it was hard to get them on a rail, but once you did it was fine. 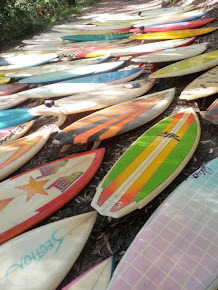 It surprised me that a lot of good surfers didn't really like them. 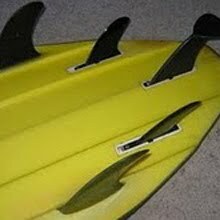 There were a lot of really badly designed twin fins. 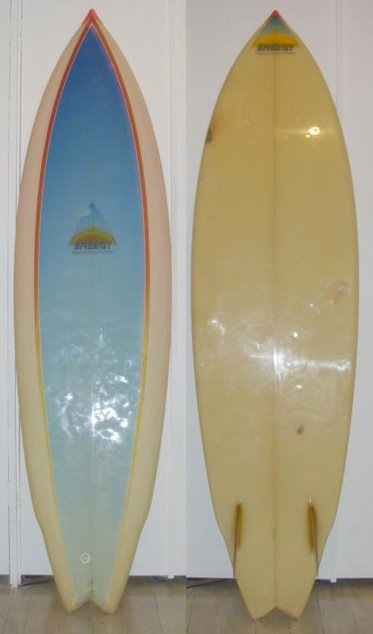 To go rail to rail, you needed a really deep vee in the bottom, and a vee that was strategically placed, that started shallow and got progressively deeper between the fins, wit a little concave in the bottom of the wing, which gave it like a fee/ double concave thing in that tail area. There was a design secret in making them work. 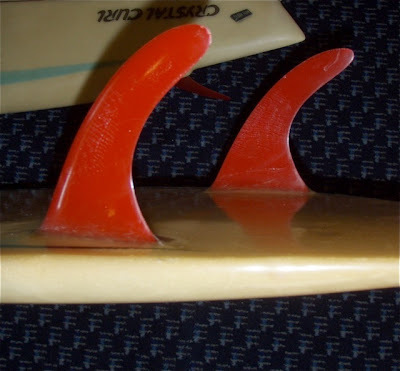 If someone said they didn't like twin fins, if you had a look at them, invariably the bottom wasn't right. I don't know if Simon persevered with them. I made a couple of thrusters and for me they felt really stiff. I could understand what he was doing and why he really liked them, but after spending so much time on twin fins it felt like I had brick on the tail slowing the board down. 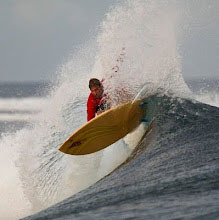 They were really easy to surf back hand, and I think that's one of the reasons why it was embraced. 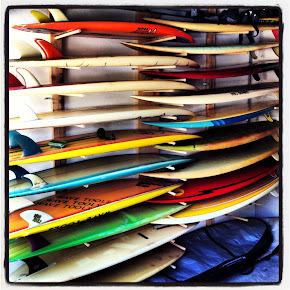 I think what happened was, all the hold outs on single fins, who resisted twin fins, the thruster gave them something to embrace." Thanks for the promotion of my twinnie - I've had offers from Aussie collectors already (although it is not for sale)!!!!!! 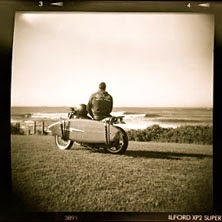 Take it easy mate and catch up again somewhere else in the world one day.